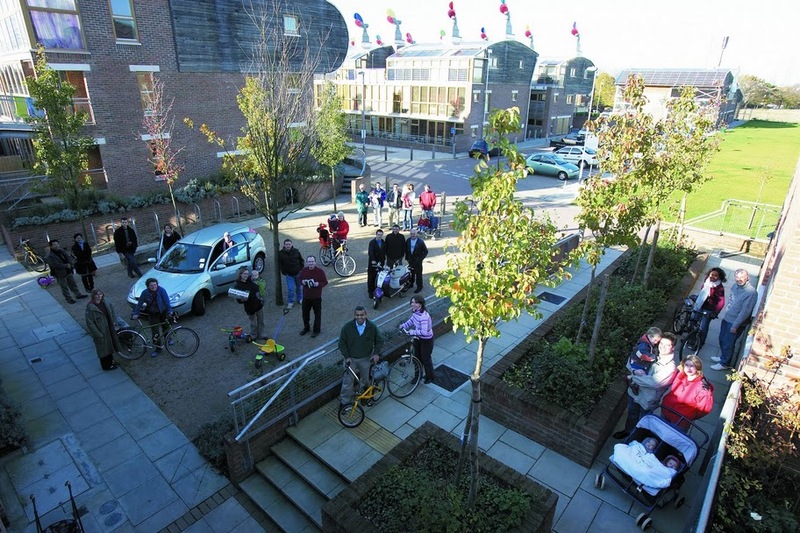 Beddington Zero Energy Development (BedZED) is the UK's largest sustainability-oriented, mixed-use community. 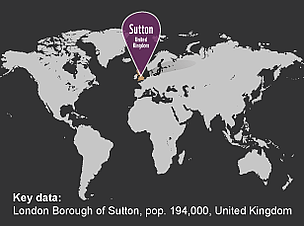 It was built in Sutton, London, in 2002 at the initiative of BioRegional, and became the prototype for One Planet Communities, a programme of BioRegional and WWF. BedZED did not achieve its original target of carbon neutrality, though it substantially reduced its ecological footprint and provided a learning experience for future projects. BedZED was created by BioRegional, an entrepreneurial charity, along with the Peabody Trust and Bill Dunster Architects. It comprises 100 apartments and houses, and approximately 2,500 sq m of office space. As its name implies, BedZED aimed to be the world’s first large-scale, carbon-neutral housing complex. Roof gardens compensated for housing density. Heating efficiency was increased through solar heating, insulation including triple glazing, and passive ventilation via the characteristic cowls on the roofs (see also Vorarlberg). Electricity efficiency was increased through energy-efficient appliances, visible electric meters to heighten residents’ awareness, and good daylight illumination. Water efficiency was increased through efficient appliances, collection of rainwater for flushing toilets, and local purification of wastewater. Green transportation was encouraged by prioritising bicycles and walking, reduced parking located at the outskirts of the area, a car-pooling service, and good integration with the public transport system. Solar panels for electricity and an experimental, biofuel-fired district-heating power plant were planned to cover all remaining energy needs. The building project was made environmentally friendly through re-utilisation of material and local resources. BioRegional’s own evaluation of the project showed mixed results. In social terms BedZED is successful – the car-free, greener and quieter central area where children play has contributed to more connection between neighbours. Residents on average know 20 of their neighbours by name, compared with surrounding areas where the corresponding figure is 8. According to 84% of residents their quality of life has increased since they moved in. The area's modern, colourful style, with balconies and gardens for every home, has made it a tourist attraction, a showcase for Sutton's future ambitious environmental policies, including, among other things, the new general plan for Hackbridge, where BedZED is located (see also Sutton). Car journeys have been reduced by 65%. Water consumption is 58% lower than the local average, and waste separation has approximately doubled. The solar panels contribute to 19% of electricity consumption, which on average is 45% lower in BedZED than in the surrounding area. 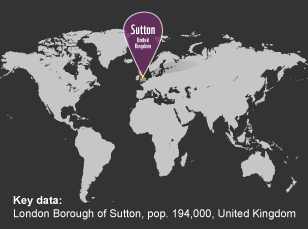 Heat use is 81% lower than the Sutton average, which means a 72% reduction in carbon dioxide emissions from energy compared with similar homes from that period. 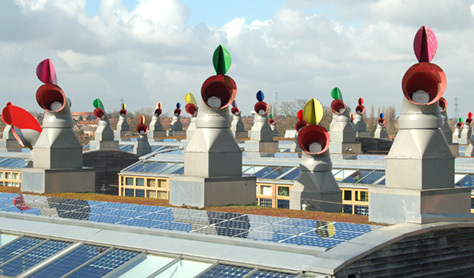 Yet Bedzed’s district-heating power plant was unsuccessful – the scale was too small to run, in technical and financial terms. According to BioRegional, the experience shows how important it is for governments and energy companies to take responsibility for developing an electricity supply system with renewable energy sources that also allows local production of electricity to achieve a substantial reduction of carbon emissions from housing. BedZED offers other lessons that led BioRegional to enhance the importance of lifestyle and infrastructure, relative to green buildings, in the creation of sustainable housing areas. Although all residents contribute CO2 savings, it is only when they change their lifestyles – by participating in area car-pooling services for example – that a reduction in carbon dioxide emissions of 50% or more is reached. Overall BedZED did not quite achieve requirements to be called a One Planet Community. But the project has had many ramifications. The car-pooling service was London's first and led to others being started. BedZED contributed to Britain's policy that from 2016 onwards all new homes will have zero carbon emissions. And above all, as a prototype, BedZED contributed a lot of knowledge when BioRegional and WWF launched the global One Planet Living campaign in 2004 and its framework of 10 principles of sustainability: zero carbon, zero waste, sustainable transport, local and sustainable materials, local and sustainable food, sustainable water, natural habitats and wildlife, culture and heritage, equity and fair trade, health and happiness. BioRegional's original vision was for a One Planet Community on every continent. If the additional seven applicants that use the principles of One Planet Living were to be endorsed, the vision would be on its way to realisation. This applies to Sibaya in South Africa, Jinshan in China, Masdar City in the United Arab Emirates, Barangaroo in Australia, Riverside One in the UK, Villages Natures in France, and Petite Riviere in Canada. In One Brighton, BioRegional has improved on BedZED’s weak points. Again, investments have been made in a biofuel-fired power plant, but this time in a larger format and owned by an energy company especially established for the project, a solution that will guarantee renewable energy supplies. 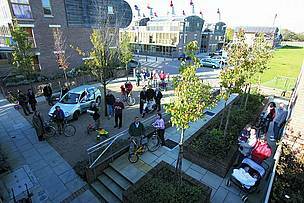 Other points are a more refined transport plan, roof gardens, proximity to the sale of organic food, composting, and a company connected to the area that is dedicated to the task of supporting further initiatives from residents and promoting One Planet Principles in the surrounding community.